Positive Injury News + Thoughts on Wigan loss and PFA Nominations. Morning to you. Feels worse than a hangover this no thanks to the loss coupled with the news on Jack Wilshere. I’d say it’s a good thing this is just coming up otherwise it would have been a real mess of a post. Wigan Athletic had two goals in just over a minute very early in the first half to thank for a memorable 2-1 win at the Emirates. It which pushes them five points clear of the relegation zone while at the upper end, allows for the Sillywhites and Newcastle as well as Chelski to close up on us in the race for Champions League places. Franco di Santo helped his former club’s cause, eventually getting the ball in the net after a precise Wigan break from a poor corner at the other end. We hadn’t recovered from going behind when Victor Moses made light work of Sagna and his deflected cross to the box was pounced on by Jordi Gomez who made it to the ball just before Szczesny to poke home a second. Both goals came just as Mikel Arteta was being treated on the sidelines so the sight of Aaron Ramsey replacing him soon after. This leaves us sweating over how bad the Spaniard’s ankle injury is with resurgent Chelsea coming up for us in Saturday’s early kick-off. Thomas Vermaelen did pull one back after 21 minutes with a good header off Tomas Rosicky’s cross and you just felt then that sure, we still got this! No we don’t got this (bear with my ebonics) as Arteta’s calming chi was sorely missed by Song, left Ramsey exposed per se and rendered our wingers wingless, Walcott especially. Walcott was on the field? Apocalyptic! Sagna could’ve done much better, Santos missed a good scoring chance in the second half, Gervinho brought nothing after replacing Benayoun, so too the Ox when he came on for Djourou. Then Arsène Wenger made some noise about the impressive Ali Al Habsi’s time wasting on the night. Well, we’d be elated to see Szczesny do same for us with a similar score at a place such as the Nou Camp or Old Trafford… I’m just saying. He has deputised pretty well for Koscielny, just unfortunate to be on the losing side tonight. Another goal and he’s certain to end the season as the league’s top scoring defender, well ahead of the likes of Fernando Torres and Andy Carroll. He had two headers well saved by Al-Habsi either side of the goals we conceded. Just shows how differently the night could have turned out for us. Summarily, we let ourselves down yet again as we were flat for large periods of the encounter with the exception being early in both halves. Like at QPR, this is just a blip and there will be no need to raise ‘unnecessary dust’ about this. Hopefully we’ll respond to this defeat just as well as we did against Man. $hitty and effectively end Chelski’s Champions League ambitions from the league end of the business, we’ll see how they fare against Barcelona either side of their visit to the Ems. And to cap a generally bad day at the office, 20 year old Jack Wilshere tweeted last night after the game that he will miss out the rest of the season and consequently the European Championships to be held at Poland and Ukraine. “Gutted, sad, devastated..its been a test mentally for me this season and it will continue to be tough until I am back out on the pitch.. “. This was soon after le boss made known at the post match what we all along have feared for the lad. “Jack will not play again this season and he will not go to the Euros, that is for sure.” said Wenger. Wenger however reckons Wilshere could make the Team GB squad to the Olympics later this year though he would much prefer that Stuart Pearce doesn’t invite Wilshere for that, to avoid a recurrence of what has been a mentally challenging year for the midfielder. Here’s wishing Wilshere good and timely recovery from this. The Spaniard faces up to 3 months on the sidelines if our worst fears are confirmed. He was seen leaving the game in crutches, with his right foot in a protective mask. If it’s any consolation, it comes late in the season. There are only 4 games left and surely we can keep our place in the top 3 in his absence. There is some good news on the injury front for us though, with Francis Coquelin due back in training this week, while Per Mertesacker will fly back from Germany in the next two weeks, having travelled to his homeland for surgery and rehabilitation on his left ankle. A decision is also expected this week on Abou Diaby, who has been building his fitness up in training, and is in contention to be in the squad for Saturday’s clash with Chelsea. Surely he can do better than Ramsey who has been unconvincing of late. Captain Vantastic has been nominated alongside five others for the PFA Player of the Year award. Van Persie also is firm favourite to get the award ahead of Wayne Rooney, Sergio Agüero, Joe Hart, David Silva and I’m sorry… Scott Parker? Why not just put Nicklas Bendtner in it then? I can feel the Dane being gutted by this ‘gesture’. Agüero meanwhile was nominated also for the PFA Young Player of the Year seeing as he is still of age as the case here is. Our own Oxlade-Chamberlain made the shortlist as well along with Wale’s Bale, Daniel Sturridge, Danny Welbeck and Kyle Walker. Apologies for the long post but last night’s victory left a sour taste in our mouths. What went wrong? Even Arsene doesn’t seem to have answers which is very unusual. Was it physical fatigue? Mental stress? Or just overconfidence? Do share your thoughts with me in the comments. Have a pleasant day nonetheless! 7 Straight Wins, We Ballin’ : The Player Ratings. Szczesny (6) – Had little to do all game. Did well when called upon. Djourou (7) – A few scary moments. Other than that, a credible performance. Vermaelen (8) – Solid game. Stood up to everything the Villa attack could muster. Helped up front when he could. Sagna (8) – Did his usual. Gibbs (8) – Good going forward as shown by the goal, but a bit suspect in defence today. Gervinho had to bail him out a few times. Arteta (8) – Kept things ticking in the middle, a couple of attempts on target, and got his goal with a phenomenal strike from a freekick. Song (8) – Did his job well, guilty of holding on to the ball for too long. Amazing through pass for the second goal. Rosicky (7.5) – Continued his resurgence with an assuring performance. A joy to see him in such good form. Walcott (8.5) – Good performance, great first touch and wonderful composure to get his goal. Gervinho (7) – Better performance. Looked lively, got an assist. Van Persie (7) – Started well but could not get a goal. Cut a frustrated figure late on, he’s surely had better days. Santos (6) – Almost gave a goal away with his first touch. Settled well in the following minutes. Great to have him back. Ramsey (6) – Came on with a fresh pair of legs. Added more bite to the midfield. The Ox (6) – Good cameo. Picked up from where Theo left off. There you have it guys! 7th straight win gives us a firm grip on 3rd place. 3 points ahead of Sp*ds, 8 ahead of Chelski. Not a bad time to be a gooner, eh? Hello good Gooners from wherever you are reading from. Been a tough couple of weeks for us, watching dear Arsenal manage to get past Leeds United between two league defeats at Fulham and Swansea, both games in which we scored first. And now, we have those demons of Manchester visiting and memories of the early season annihilation comes to mind… can we pull a win off? Asides, Le boss admitted to watching our 8-2 defeat again “because you have to face reality” said the Wenger. While he believes the scoreline was an “accident” on the day, Wenger has nonetheless called for the backline to get their acts right ahead of Sunday’s crunch encounter. “When you come back to 2-2 and then 30 seconds later it is 3-2, it is very difficult to swallow.” admitted the manager just as he expressed his surprise that we lost to Fulham and the Swans, no thanks to defensive errors and called on the defence to be improved for Manure’s visit. Away from that, Wenger would rather not lose our favourite Russian Andrei Arshavin, who will be celebrating a third year at the club soon. The manager’s reasons being the squad worn thin by injuries coupled with his quality and admittedly, the cocky Russian’s put in good performances recently. Finally, Wenger updated in the injury situation at the club, stating Thomas Vermaelen doesn’t look like he’ll play on Sunday as well as Thierry Henry who has a calf problem. Mikel Arteta is completely out while Bacary Sagna, Kieran Gibbs and Carl Jenkinson are a couple of weeks away with Jack Wilshere set resume full training soon after them. Quite a number of bodies we’ve got in the injury room. That’s the bit from here so far. 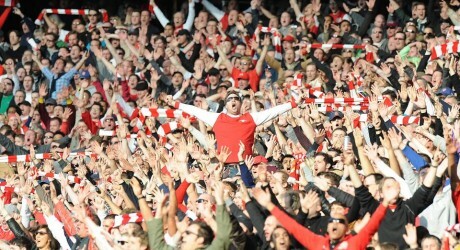 Don’t forget to follow us on twitter @goonermemoirs and have a great weekend, expect a preview of the big game on tomorrow.